Dr Bob Delmonteque, America's top senior fitness consultant, inspired me to change my life to regain my fitness, vitality and health. Dr Bob is still my role model. At 84 years of age, Dr Bob runs marathons, cycles 120 miles, and bench- presses over 250 pounds. What this means is that Bob Delmonteque lies on his back on a bench, then lowers and raises a bar with steel plates attached to the ends weighing 250 pounds—not to mention the weight of the bar itself, probably 45 pounds. Let's just say he can raise 300 pounds above his chest. NASA recruited Dr Bob to set up and run the physical and mental health program for the first two sets of Apollo astronauts. Bob Delmonteque trained astronaut John Glenn in the 1960's, and again in 1998 when Glenn returned to space as the first senior to do so. 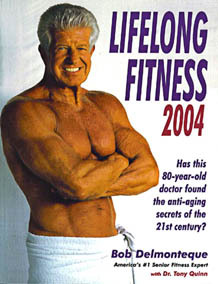 Bob Delmonteque's book Lifelong Fitness distills 65 years experience as a health and fitness expert. The guidelines are so easy to understand that anybody can use the book to dramatically improve their own health and appearance. Bob Delmonteque may be the role model you can follow too. Amazon has a few used copies of the book as well as the updated 2004 edition. If you order from your local bookseller, you may need this reference: ISBN: 983-42041-0-8. Does Dr Bob's approach only work for people who have been fit all their lives? I have read Bob Delmonteque's book. More than that, for the past year I have lived the book and I know that what Dr Bob says works, even for people who have let themselves go. I didn't have proof when I started. I just believed. I didn't say to myself, "But he's been doing it all his life. It's too late for a broken down old nag like me." I just did it. Still skeptical? I include links below to stories about other role models who got the wake-up call late in life and found that even at 60 or above. It's never too late!. with Maureen "Moe" Jeanson—how she learned to burn the fat, losing 76 pounds of fat from February to February 2006.